After watching the staff work hard to transport materials and products to and from a coffee processing company, Vũ Quang Thọ asked them why they didn’t think of a way to save time and effort. The head of the Institute for Workers and Trade Unions was surprised at the answer he got. “They said, ‘Why do we need to change? In the end, the benefits will go to the boss’s pocket, not ours,” Thọ told Việt Nam News. The lack of incentive, initiative and willingness to change is holding back the nation’s labour productivity, Thọ said. According to the International Labour Organisation (ILO), labour productivity is an important economic indicator that is closely linked to growth, competitiveness, and living standards. Labour productivity measures the goods and services produced per unit of labour; more specifically, it measures the GDP produced per unit of labour. A General Statistics Office (GSO) report said last year that labour productivity per capita was VNĐ84.5 million (US$3,730) in 2016, a 5.31 per cent year-on-year increase. 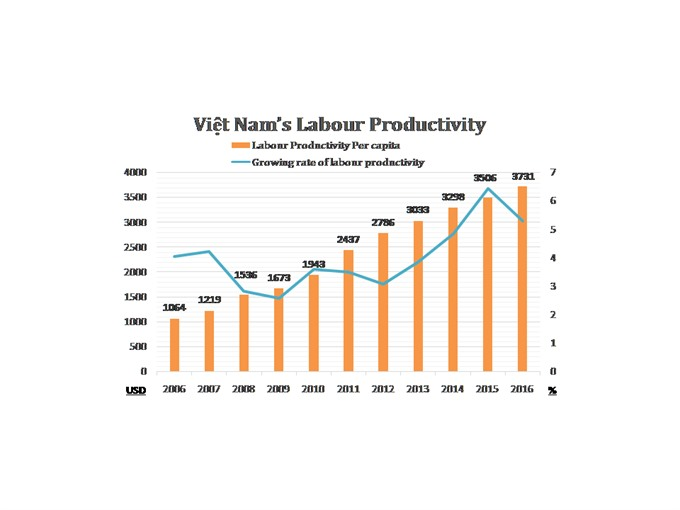 Compared to 10 years earlier, labour productivity has risen by over VNĐ60 million. It was VNĐ24.1 million ($1,064) in 2006. In the past two decades, labour productivity in Việt Nam grew at 4.3 per cent on average, the highest increase among ASEAN countries, according to the ILO. 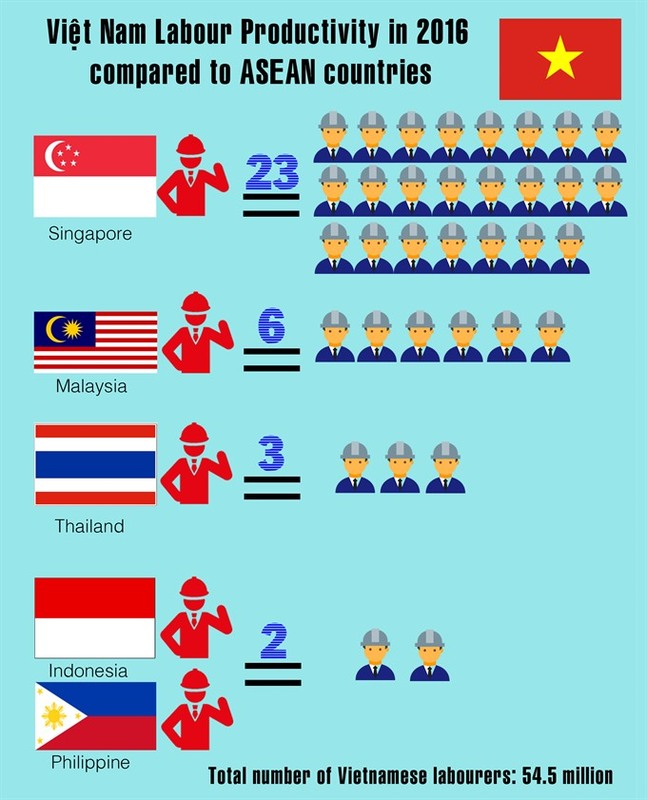 However, in comparison with ASEAN states, Việt Nam’s aggregate labour productivity is still near the bottom. The GSO warned that Việt Nam’s productivity growth has been outpaced by Laos, and is only higher than Myanmar and Cambodia in the region. Nguyễn Anh Tuấn, head of Việt Nam’s National Productivity Institute, said although Việt Nam has narrowed the gap with more advanced countries like Japan and Singapore, it remains the same, and in some cases, is being widened with regional economies that are primary competitors, like Thailand, Philippines, and Indonesia. “Malaysian labour productivity is now more than six times that of Việt Nam. Based on each country’s productivity growth target, it would take Việt Nam 97 years to catch up with Malaysian productivity,” Tuấn told the Việt Nam News. With less developed economies in the region, the gap is narrowing. “Việt Nam is still more productive than Myanmar but without any changes in the growth rate of productivity, Myanmar will soon catch up with us,” said Tuấn. Thọ said the inertia mindset of workers is a main factor restraining productivity growth. “Workers don’t feel the need for self-improvement in knowledge and skills to increase productivity because they feel secure once they land a job,” Thọ said. He said this thinking is particularly common in State-owned sectors due to the lingering influence of the decades-long ‘subsidised economy’. 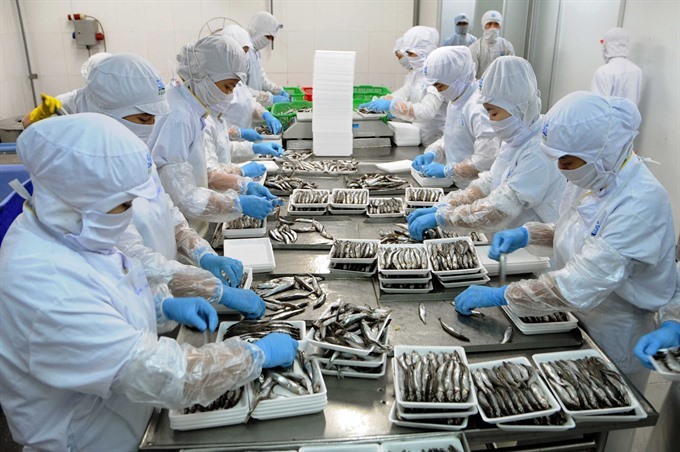 Even people in managerial positions are not feeling the need for innovation to improve productivity, said Terasaki Akashi of Hirayama Vietnam, a company that offers consultancy services on renovating working methods for higher productivity in Việt Nam-based enterprises. Akashi said managers are also easily satisfied, as long as the company makes a profit. They are not aware that without timely changes, their companies will soon lag behind. He said they are not aware of what is being wasted in the working process - a factor that holds back productivity, and do not have a thorough understanding of innovative methods, either. 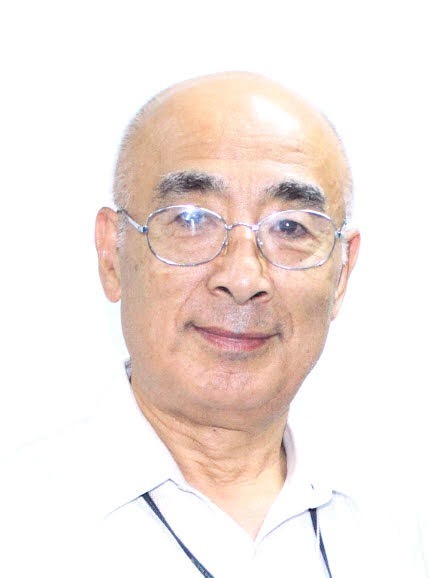 Nakata Akashi, another Japanese expert on labour productivity, wrote in his article published by the Nhân Dân (People) newspaper that he had seen quite a few high-skilled Vietnamese labourers failing to maintain discipline. “They go to work whenever they like and drop out when they don’t. “Many ask for leave to harvest rice, join village festivals, go to weddings or even to go to a hair salon,” he wrote. Weak teamwork is another problem, he said, citing an experience with a garment company in HCM City where he found workers engaged in different parts of a shirt making process were not aware of their correlation. “Worker making shirt collars do not co-operate with those making sleeves, while those making sleeves do not feel any link with QC (Quality control) staff. But if sleeves have been completed, while collars are not, the final product cannot come out, which means nothing for the QC people to check,” he wrote. He said it is only when workers understand the need to collaborate that the production process accelerate and lead to an increase in productivity. But experts say apart from skills and attitudes there are other factors behind the nation’s low productivity. A majority of workers are continuing in lower-value sectors like agriculture-forestry-aquaculture, despite the economic structural changes over the past few decades. According to the General Statistics Office, GSO, 41.9 per cent worked for agriculture-forestry-aquaculture sector, 33.4 per cent work for services and 24.7 per cent work for industry-construction. The productivity of workers in the industry-construction and service sectors is higher, said Nguyễn Anh Tuấn of the National Institute of Productivity. It is the low labour productivity of the agriculture-forestry-aquaculture (VNĐ33 million per labourer) sector that has dragged down the overall national productivity, he said. Moreover, Việt Nam is often involved in processes that do not add much to the value chain, Tuấn pointed out. “For example, we grow rubber trees to export latex but we don’t make gloves for export, which brings much more money,” Tuấn said. 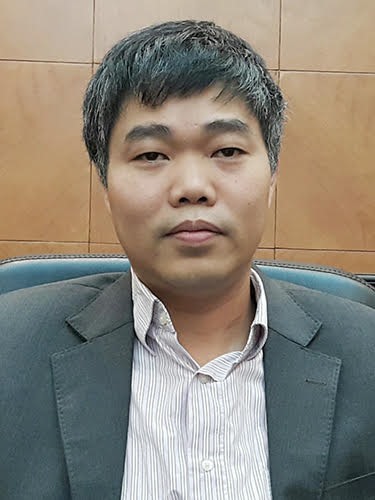 The slow application of science and technology is also hindering Việt Nam from boosting its labour productivity, said Thọ of the Institute for Workers and Trade Unions. According to a recent Global Innovation Index compiled by the World Intellectual Organisation, Việt Nam ranks 71st among 141 economies and 4th among ASEAN countries in terms of technology innovation. More than half the Vietnamese enterprises are still using old and backward technologies, especially small-scale ones. Since application of advanced technology often costs a big sum of money, many investors, both domestic and foreign, are still reluctant to invest. “They still choose to utilise the cheap labour force that is still available in Việt Nam to generate profits. “But this choice will soon be challenged with the Industrial Revolution 4.0,” he said. Resolution 5 adopted last November by the 12th Party Central Committee has made increasing labour productivity one of the three pillars for achieving a new growth model for the country, besides growth quality and increased competitiveness. The resolution has set the target of increasing productivity by 5.5 per cent per year, and to have 30 to 35 per cent of enterprises engage in innovative activities every year in the 2016-2020 period. It also envisages that Việt Nam narrows the productivity and competitive capacity with ASEAN-4 countries (Indonesia, Malaysia, Philippines and Thailand) in the coming years. To achieve these ambitious targets, multiple measures have to be taken with concerted efforts made by both the State and businesses, experts said. However, Thọ reiterated that the most important thing is to change the mindset of workers. “Labour productivity should be made an ethical issue for every worker,” he said, citing the example of Japan, where workers are famous for their unceasing efforts to do better at work. He said this can be done by increasing activities to honour and reward labour productivity, like contests for high-sklled and other measures to encourage innovation. Such activities have already been in place but the Government should “make them national activities for boosting labour productivity,” Thọ said. The movements or campaigns should also be conducted at companies to raise the awareness of both managers and workers, said Terasaki Akashi from Hirayama Vietnam. It is also important that companies nurture an environment in favour of creativity and innovation by having a system to frequently praise and reward good innovation ideas, something that is common in Japan. If a worker shows good initiative, he or she should be publicly complimented by the managers. The worker’s achievement should also be reflected in personal annual evaluations and be considered a factor for salary increments. 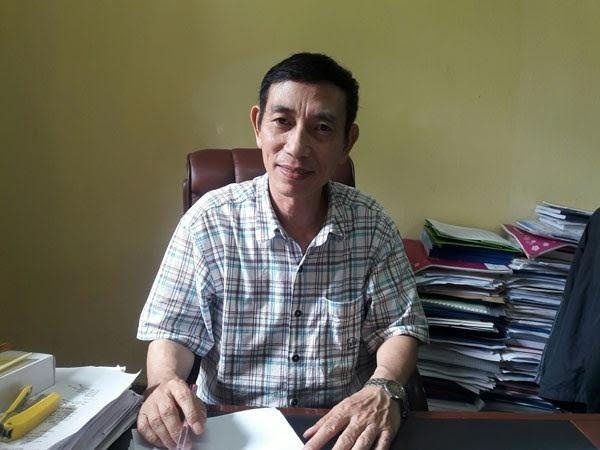 “Such a system is still not popular in Việt Nam, both in private and public sector,” Thọ said, adding that ensuring good salary and benefi policies for workers is another crucial factor to motivate workers. Amidst the exponential pace of science and technology development, all experts agreed that innovation and technology change is necessary. But they warned that it will only work with simultaneous improvement of workers’ knowledge and skills. To that end, “it is important to improve the quality of the education system, both general education and technical and vocational education and training”, Thọ said. Tuấn agreed, noting that many enterprises are unable to use modern machines they have bought because there are not enough skilled workers to operate them. However, he said. education and training should not only rely on the general education system. “Each company should also have its own in-house training system to develop workers’ skills. “The general system cannot deliver for all types of work. Companies should define requirements for each position and conduct appropriate in-house training programmes. “Before a worker starts a job, he or she should receive mentoring with detailed instructions,” he said. At the national level, Tuấn said, the Government should further enhance the structural shift that has happened over the past decades to promote the development of industries with high labour productivity. “This would attract more workers from lower value industries like agriculture to higher value ones like manufacturing and services, generating an impetus for the society as whole,” Tuấn said. Apart from a general solution to increase productivity for the whole economy, the Government should focus on particular solutions for each industry as each of them has its own hurdles, he said. This should most importantly apply to spearhead industries with big advantages and development opportunities, he said. “The Government should invest without reservation for achieving new productivity levels in some key industries, for example information technology or machinery manufacturing,” he said.